One thing I want to do more of in the new year (that's quickly approaching), is share design inspiration. Nuggets and tidbits of awesome work from past and present. But why wait? Let's get into this now. 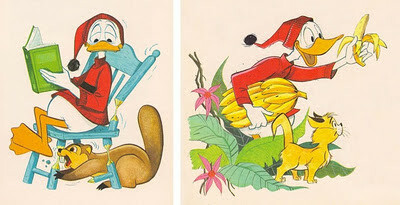 I'm a huge Disney fan so I was lucky to find these great illustrations of Disney's Donald Duck. It has that classic 60's illustrated feel that many of us grew up with in one way or another. For me this work reminds me of preschool and middle school. These are the kinds of illustrations that originally inspired me to draw and create my own characters. Does anyone remember Golden Books: Little Golden Books? They're very narrative and I think that's what I love about them the most. There doesn't need to be words to know what the story is. These were illustrated by Giovan Battista Carpi who is well known for illustrating many Disney Books and Scrooge McDuck comics. 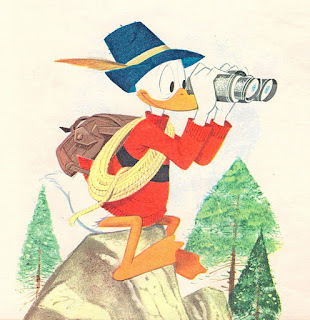 Donald is a little off model, especially where his bill and eyes are concerned but this is still masterful work. I'm envious! If you'd like to see more Disney related design inspiration check out ImagineeringDisney.com. What do you think about these illustrations? Do you remember them from childhood? Are there any other sites that you would consider design or illustration inspiration? Please share your thoughts and ideas in the comments section.